Back in early May, I showed a grid that I had drawn with the possibility of making it into some type of quilt art. This is my start on it. On a piece of foam core board, I taped the drawing down. Peeled of the top layer of the Steam-a-Seam so that the sticky part is accessible. Then thumbtacked it over the drawing. I used a card stock version of the same drawing to use as a pattern. I cut the pattern into five or six larger pieces. Starting with the center I cut black and white pieces for the center rectangle(rhombus?) It isn't square. 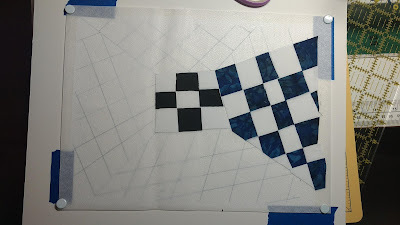 Then I took the next section and cut dark blue and white pieces for that section. I will tell you that some good tweezers are very helpful in placing the pieces to get them where you want them. I will show those in a future post as I work through this process and share it with you. Are you just cutting same size squares and then quilting over it in the end or are you actually cutting and sewing each individual square? This is interesting. Looking forward to watching this come together. The dimensional quilt is coming along nicely. I made your peanut butter/cream cheese icing. I spread it over a triple fudge cake (mix) and it was WONDERFUL! We had it with friends, and they loved it, too. Thanks!